It’s been seven months since Apple released Final Cut Pro X amidst furor and bemusement; four months since the company released its first major update, with promised support for more pro-level features in the next year. That year is here, and with it, Apple brought its third major update to the platform, offering multicam editing, updates to Chroma Key, beta broadcast video monitoring, and an assortment of other improvements. Three firms have been working with Apple to implement monitoring via PCI Express cards: AJA Video Systems, Blackmagic Design, and Matrox. In addition, Final Cut Pro X will offer monitoring through the Thunderbolt port, allowing editors to check broadcast-quality video on-set through devices like AJA’s IoXT and a Mac laptop. With regard to multicam editing, Townhill noted that Apple held off on offering the feature until it could bring something new to the field. As such, the company’s iteration of this tool offers a full 64 slots for source video, none of which need to share resolution, codecs, or framerate to cooperate. To organize the footage, users can add new camera angle metadata onto sources; in addition, syncing content no longer relies solely on timecode. Instead, clips can be synced using data and time, or Apple’s new Audio Analysis feature—unique to FCP X—which automatically matches scratch audio waveforms from simultaneous set footage. 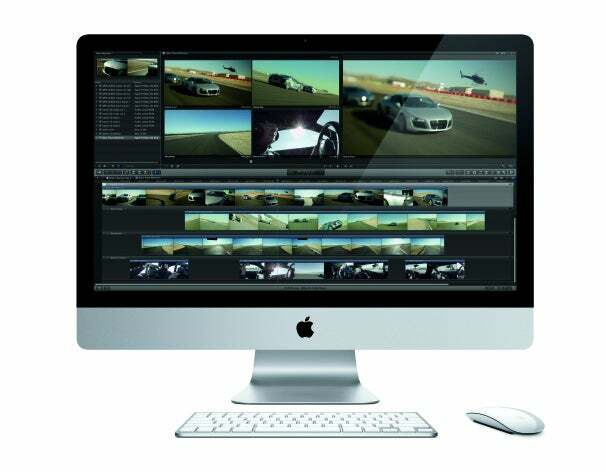 Multicam editing in Final Cut Pro X supports up to 64 angles of video. Improvements have also been made to Final Cut’s Chroma Key tool, which received new granular controls for complicated effects. This allows editors to stay in-program when attempting to key out tricky blue- or green-screen compositions, rather than banish them out to Motion or another external compositing program. Additionally, users can now re-link media and import layered PSD files, along with several other smaller improvements to the app. Of course, some users are still holding steadfast for EDL exports, one of non-linear editing software's older tools. When asked about the likelihood of supporting the older EDL standard in a future update, however, Townhill noted that the format was originally designed to work for a single track of video, and while Apple appreciated its long history, the company’s focus is now on XML. Current users can download the FCP X update from the Mac App Store for free; new users can purchase the software for $300 or take a 30-day test-drive by downloading the free trial from Apple’s Website. Meantime, be sure to check out our first look at FCP X 10.0.3, as a longtime videographer takes this new version for a spin. When Final Cut Pro X was first released, there were many gripes and grumbles about the application, but none so prominent as the lack of support for projects created in earlier versions of Final Cut Pro. Third-party developer Intelligent Assistance seeks to change that with its new 7toX for Final Cut Pro converter, available on the Mac App Store alongside the newly released Final Cut Pro X 10.0.3 update. While all media must be online throughout the process, the converter proposes to handle the transition as smoothly as possible; according to Hodgett, “the process is seamless to the user.” The big stuff—bins and sequences—are translated to Keyword Collections and Compound Clips, respectively. The program will also attempt to match transitions, motion settings, composites, speed changes, and audio/video filters to versions supported by Final Cut Pro X. Additionally, 7toX for Final Cut Pro supports multicam project conversion. Of course, transcoding a Final Cut Pro 7 project to FCP X won’t be flawless—users will most likely have to do some cleanup and transitional work—but 7toX provides a few nice buffers to ease the move: It marks any changes that occurred during conversion through To Do markers and checks for any media corruption; a detailed help section on Intelligent Assistance’s Website is also available. The app is available on the Mac App Store for $10; if this motivates you to give Final Cut Pro X a try, you can download a 30-day free trial from Apple’s Website.